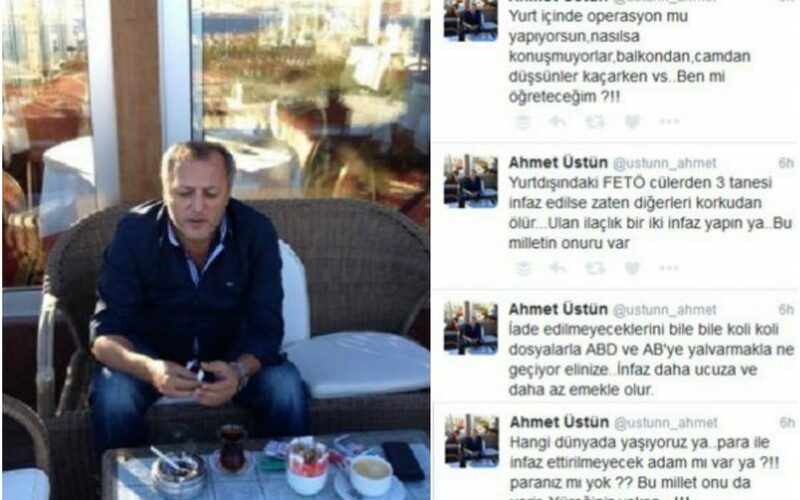 Amid assassination concerns following the suspicious deaths of two people who allegedly fell from the balcony of their homes, a pro-Erdoğan Twitter troll named Ahmet Üstün (@ustunn_ahmet) on Friday called on the government to assassinate Gülenists in the country and abroad. “You’re conducting domestic operations. They do not talk, anyway, they could have fallen from balconies or windows while trying to escape, etc… Should I have to teach you all of that?! !” Üstün, who has 15,000 followers, tweeted. A 59-year-old Turkish writer, Mustafa Hikmet Kayapalı, died on Wednesday after falling from a three-storey building as he was reportedly attempting to escape from a police raid carried out as part of an investigation into the Gülen group. In a similar incident last week, Gültekin Payat, a 41-year-old teacher with an outstanding arrest warrant issued for him as part of another investigation into the Gülen movement, died after falling 10 meters from a balcony, as he was similarly attempting to escape from police officers. “If you could execute three of members of FETÖ [a derogatory term used by government circles to refer to the Gülen group] abroad, the others would be scared stiff. Guys, carry out one or two executions as a deterrent. This nation has its honor,” Üstün said. “What do you gain when you beg the US and EU with boxes of files despite the fact that you know they won’t be extradited. Execution is cheaper and requires less effort. What a world you live in. Is there any person who could not be executed in exchange for money? Don’t you have money? This nation would provide the money, too… But not if you don’t have a brave heart…!! !” Üstün added. In September Üstün called on the government to make plans for the massacre of all Gülen sympathizers who are currently behind bars. “There should be no other inmates in the prisons where FETÖ members are jailed. Special execution teams should be deployed there. FETÖ and its jailed members should know that only the dead bodies of FETÖ members who make escape plans can be taken out of jail. The guns of prison guards should be taken away, FETÖ members including military members, police officers, prosecutors and judges should be collected in one or two prisons. PÖH [special police units] should operate with the authority to kill 24/7,“ wrote Üstün in a series of tweets. This article originally appeared in Turkish Minute on May 12.